The Barclays Center, hemmed in by ghost towers, courtesy of the New York Times. Okay, I have a soft spot for Shop, a local architecture firm that is better than most at wedding innovative form to urbanistic function. And, unlike most people who are outraged by the Atlantic Yards debacle, I am basically okay with the idea of putting a basketball arena at the intersection of Flatbush and Atlantic. My okayness with the arena, however is predicated on a major upgrade for the nasty mess of a subway/railroad station below and serious amelioration of the monstrous traffic situation outside. And my okayness is tempered by the recent projection from the city’s Independent Budget Office that shows the city losing some 39 million on this deal over the next 30 years. 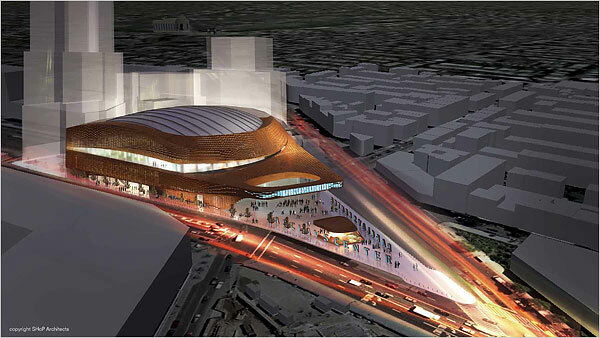 I think the Shop collaboration with Ellerbe Becket has produced the best renderings I’ve seen for the arena, better than all those Frank Gehry renderings. Having said that, I feel compelled to point out that they are just renderings and renderings, especially in this case, mean nothing. For one thing, I can’t help but notice the ghost buildings that appear in many of the elevations, place holders for the towers that will someday, perhaps, spring up. The potential out-sized badness of those undefined shadow buildings has the potential to undermine any niceness our talented friends at Shop can provide. The plan, I’m afraid, is still the problem. P.S. Yes, I seem to have taken the summer off. Not planned. It just happened. P.P.P.S And here it is 9-11. It’s been a very long eight years, hasn’t it?